A lot of soda fountain beverages back then were promoted as healthy or at least, medicinal. Coca-Cola started that way. So I’m not surprised that this would have been intended that way as well. 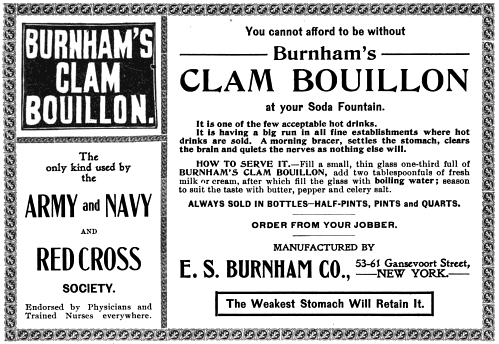 Still, though… clam juice and cold milk… CARBONATED… I really wonder if anyone actually drank this. Okay, that sounded pretty awful at first read, but it is combinging clam juice with milk and soda any different from combining it with beer and tomato juice? Clamato Chelada. Okay, that’s pretty horrible, too. Might be just me, but I think clam juice and milk sounds much worse than clam juice and tomato juice and/or beer. But if it’s hot, it’s soup. And that’s less gross for some reason.